(15 September 2018) We review taped seams. The 1 October issue will review plywood joints. The mast partner closure on Norm Wolfe's Normsboat. 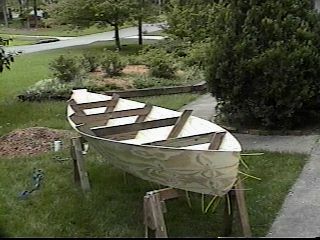 I remember seeing taped seam construction first in an article in the old Small Boat Journal about Sam Devlin's efforts. That was probably about 35 years ago (time flies). But by then the method was old in England. I think it was "invented" by an Englishman in the late '50's and was quite common there by the 70's. 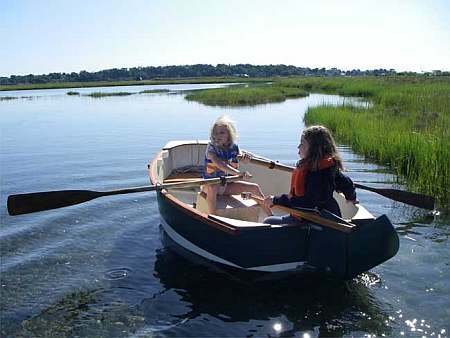 The Mirror dinghy was done that way with kits meticulously made from plywood with notches and tabs to fit the pieces together like a balsa model airplane kit. I visited England in 1982 and saw hundreds of Mirrors stacked on end at Portsmouth. Around the same time kit makers like Clarkcraft were selling kits of kayaks made that way but they called the method "sewn seam" which I think threw some of us off. "Sewing plywood together with wire - that sounds hard!" I said to myself. Harold Payson and Phil Bolger tried it in the early 80's with several designs that are still around. Harold called it "tack and tape" because at the time he didn't like using wires to temporarily fasten the panels together. He used small nails and adhesive tape, then hot melt glue, but eventually came around to using wire like everyone else. Next I think was Toto which sort of evolved from the Payson canoe. Cheap lauan plywood with epoxy resin this time but still with Bondo fillets. The plywood delaminated after 20 years (unlike the fir and pine ply used in Piccup and Roar) but the joints were still very solid. When I cut it up I sort of knocked out the remaining plywood and was left with the skeleton of the seams still intact. The last was WeeVee which used cheap lauan plywood and reverted back to polyester resin and Bondo. Gave it away after ten years or so. "What's with all the polyester resin and Bondo?" you ask. Anyone who mentions using these in the rec boatbuilding newsgroup gets pounded and made fun of. Even years ago Payson was attacked for building with polyester. I didn't know any better and have really had no troubles. Whenever I use one of my polyester boats I tell it, "You'd better start falling apart soon. You're making those experts look bad and they are going to pound me on the newsgroup and make fun of me." So far my boats haven't listened. Polyester has certainly worked OK for me. My boats are stored under cover as a rule (although some have been outdoors for months at a time). That may be a factor in their longevity with polyester. 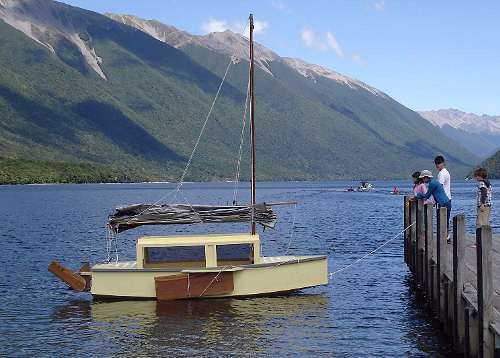 Where I live you can never expect to get your money back on a homemade boat, even the cost of materials. I think when we started years ago we got polyester for $13 a gallon (good stuff too) while epoxy went for about $70 a gallon. Now we know where to get much cheaper epoxy. So now I advise epoxy and it really is better. Of course if you are using expensive plywood, etc., you need to use epoxy. (This is how I do it. Others have their pet methods.) Not much to it. My boats are all designed from the inside out, so to speak. The dimensions are arranged such that the panels should make kissing contact on the inside edges as shown above. Usually the project is upside down at this time, sides, bulkheads stem and stern fastened together, and you are trying to put the bilge or bottom panels on with taped seams. You put the panels into position and drill pairs of holes about every 12" around the perimeter, about 1/4" in from the edges. You take pieces of soft wire, I prefer stainless steel aircraft "lock wire" but almost any wire will work if it is pliable, and cut lenths about 6" long and form them into a long U shape like a staple. Get inside the project and push the wire staples up through the holes so that the ends now stick out through the outside. Get outside with a pair of pliars and twist the wires until they tighten the panels together. If you overtighten you might break the wire or tear the wire right out of the wood. Eyeball the joints to make sure they are fair. You can open a joint up to maybe a half inch if it will help. If two panels are binding too tightly, you can run a saw down the joint to loosen it up. I think a small gap or V is preferred because it allows resin to flow in and seal the ends of the plywood. But the joint fit is really not too critical. Philsboat is essentially an IMB with the nose extended to a pointy bow. The width and multichine configuration are the same as IMB's. The cabin is 3" deeper because Phil is at least 3" taller than most of us. In a boat with a Birdwatcher cabin like this one added depth to the cabin makes it safer in that the righting forces in a knockdown are greater. That would be true of any boat if the center of gravity did not move with the cabin roof but with the normal cruiser adding depth to the cabin also means raising the crew deck up so the folks can see over the raised cabin. And that means the CG is elevated too, and then all bets are off concerning self righting. But with a boat like Philsboat eveyone rides down low inside looking out through the windows. In addition to the pointy bow and added headroom I added what I hope is a serious motor mount. Probably 3hp will drive it as fast as it will ever go and that at part throttle. But the motor well gets to looking pretty large even for such a small motor. For one thing it must be deep to put a short shaft motor on a deep stern like this so I ran it straight down to the boat's bottom. Working on the motor down it its well will be about impossible and you might need to keep an eye on your knuckles when you pull the starting rope. 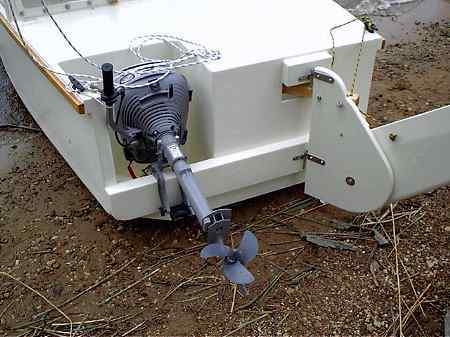 And the well must be surprisingly wide to allow the motor to swivel in steering although the usual case here will be to keep the motor locked straight ahead and steer with the tiller. The wide well pushed the rudder off center and you need a crooked tiller or rudder linkage to make it all work. I opted for a simple but crooked tiller. 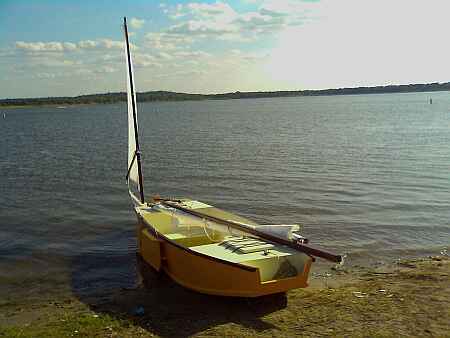 I also added low seats like those I saw added to the two IMB's that came to the Lake Conroe Messabout. Pretty much the same as what I have in Scram Pram where the seats do double duty as water ballast tanks. Philsboat seats could easily be converted into water ballast tanks also but the IMB capsize tests imply the ballast isn't needed. 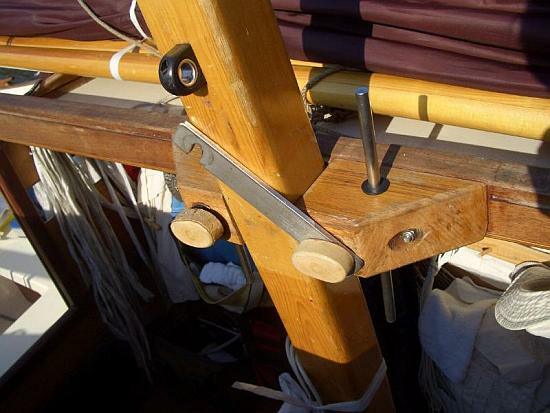 The sail rig uses a balanced lug, 113 square feet and the same as that of a Bolger Windsprint. 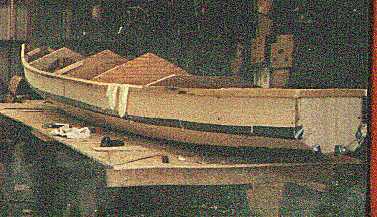 Philsboat uses taped seam construction. Five sheets of 1/4" plywood, five sheets of 3/8" and three sheets of 1/2" plywood. Actually the size and material list for Philsboat are about the same as that of Scram Pram. So which boat would be better? Take Philsboat if you are a pointy bow guy. It should be better in really rough water. On the other hand Scram is wider and roomier. 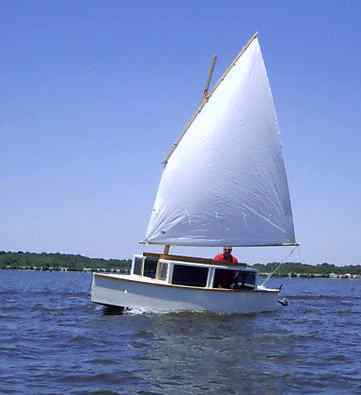 It has a flat step through bow that will splash and spit in rough water but makes beaching a very nice experience. Update, 2007. 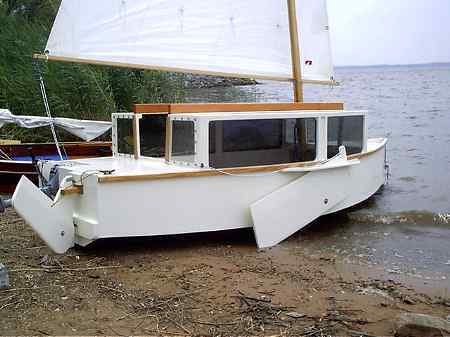 Chris Feller completed his Philsboat, probably the first prototype completed, and brought it to the 2007 Rend Lake Messabout. 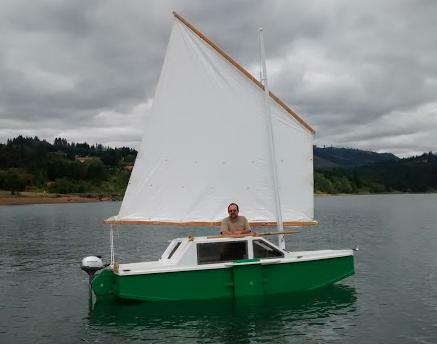 Very well made and to plans except he used the 91 sq ft lugsail he had on hand for his AF3, with some mast rake changes he calculated with his "sail area math". Sailed correctly rigtht off the drawing board, so to speak. We had a chance to use it for a few really nice days. In a good sailing breeze, say 10 to 15 knots with occasional whitecaps, our gps bobbed between 5.5 and 6mph for two hours of reaching as we crossed back and forth on the big lake. 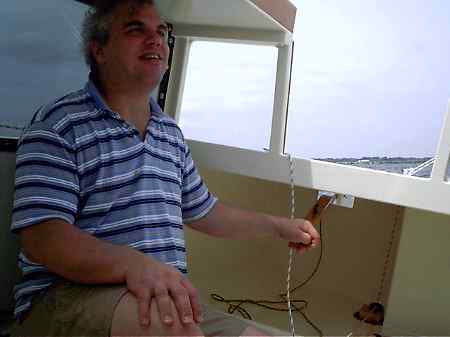 When I used the Philsboat I thought it was probably just as easy to enter from a beach as the blunt bowed Scram. The front deck is about 2' high so you can sit on it and swing you legs around onto the deck and then into the cabin. Chris is a big boy but there was plenty of room inside for the two of us and more. Rumor has it that at the campsite the night before Chris slept in the Philsboat on the trailer with an airconditioner in the front hatch plugged into the campsite power. So the boat is plenty big in the way most people would use it. The stern layout has the motor in a small well to one side and the rudder offset to the other side to give the motor room to swing. 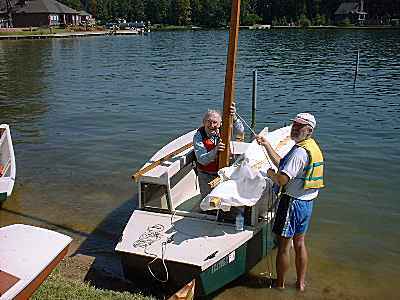 There is no linkage to the tiller, the tiller is simply "unstraight" so that is falls on centerline at the skipper's hand. Seems to work well and is quite simple. Chris uses a 2hp Honda which has a fairly large cowling for its size and must be rotated 180 degrees to grab reverse. He said the motor well size is a bit too small for that. Karl James had the same problem with his Jewelbox a long time ago and simply cut away the side of the hull in top of the motor well region - after all it is just there for looks. 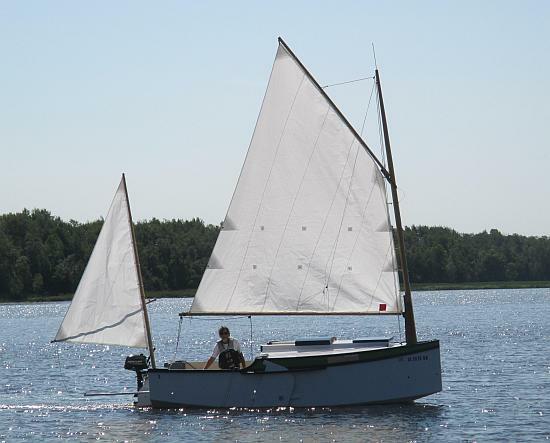 Chris said he tried the boat under power and found it went 6 mph max, just like under sail. No surprize to me. My Birdwatcher also maxes out at 6mph under 3hp and under 5.5 hp. This sort of hull will only go so fast. Add more power and you just dig a deeper hole and make a bigger wake - you won't go faster. But sometimes more power is nice on a windy day. 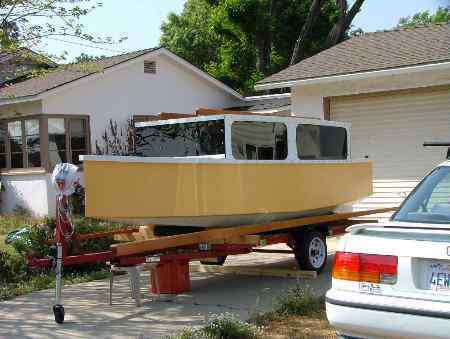 You might recall from the Prototypes section recently that there was another Philsboat being built in California. That one last I heard was about to be launched. Has more changes from blueprint than Chris's boat but still is pretty true to form. Seems to be known as Bumble and made by Rex Meach. Plans for Philsboat are $45.